8 Ton 12 Hp Air Cooling Industrial Water Chiller is used in the control of cooling products, machinery and plant machinery and is widely used in the plastic injection and blow molding industries. Industrial coolers help increase productivity and minimize scrap in the finished product. The cooler will be cooled using a vapor compression or absorption cycle. 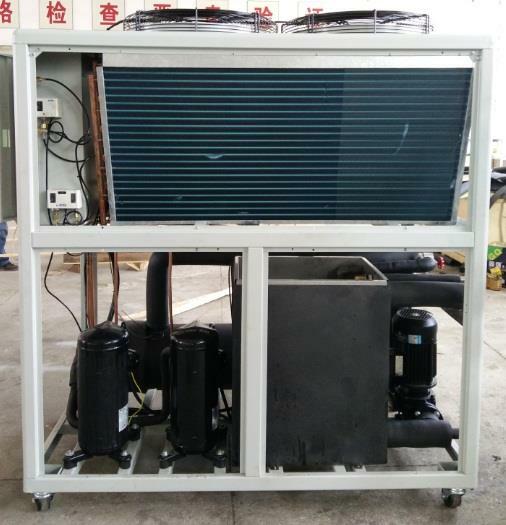 8 Ton 12 Hp Air Cooling Industrial Water Chiller is used in the control of cooling products, machinery and plant machinery and is widely used in the plastic injection and blow molding industries. Industrial coolers help increase productivity and minimize scrap in the finished product. The cooler will be cooled using a vapor compression or absorption cycle. 8 Ton 12 Hp Air Cooling Industrial Water Chiller uses a high-capacity shell-and-tube evaporator with excellent heat exchange performance, especially at high ambient temperatures. It is equipped with a tube-and-finned double condenser for excellent heat transfer and rapid cooling. Its compressors, pumps and blowers have overload protection and all pipes are insulated to avoid local convection. The control circuit adopts phase sequence protection design, and the refrigeration circuit is controlled by high and low voltage switches.